In the days of King Solomon’s great kingdom, land represented wealth. Certainly the King himself ruled over a relatively large area of land. But it isn’t the amount of land Solomon owned that brought him fame. Rather, we remember the wise monarch because of the temple he ordered to be built on that land, as well as the palace he commissioned for himself. 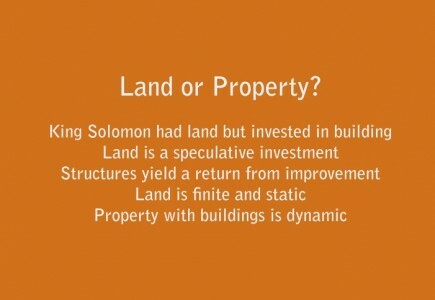 King Solomon understood a key point about real estate: what’s on the land is worth more than the land itself. Traditional wisdom has it that land purchases are the core of smart real estate investing. But as Jason Hartman points out, land is a highly speculative investment. . Land investment offers virtually none of the benefits of rental income property for building long-term wealth. With maintenance and upkeep, both tax-deductible, and the booming rental market to keep a wide pool of available tenants ready to rent, the “packaged commodities” of housing structures on a piece of land represent solid investment opportunities that can’t be reaped from land alone. One way to invest in real estate has been to buy land at low prices and either build new structures on it, which can then be rented or sold, or hold the land against a future time when it can be sold for a higher price. But as Jason Hartman says, land is a highly speculative investment for just those reasons. Land values may rise in some markets, but the potential for a return on that land depends on other factors. In order to see a return on a land investment, the land must have something to offer, and vacant land offers little in the way of ongoing returns on the investment, Rather, this kind of purchase gobbles money in the form of property taxes and any other costs deriving from local and state ordinances. Land values may fluctuate, but it’s the structures on the land which can appreciate and yield income. But building those structures depends on conditions in the housing market overall. In markets where construction is flat and building costs are high, it may be prohibitive to develop that piece of land. The prices of the commodities that go into the building of a house or other structures fluctuate too, depending on demand and availability. It may take years to see a return on a new house or multiplex placed on that cheap piece of land. Likewise, holding land against future demand and higher returns is highly risky. Investors taking this path are gambling that years from now, the land will be worth more for its location, or that eventually developments on the land will yield a big enough return to justify the investment. Since trends are fickle and the costs associated with owning that land still have to be paid whether the investment yields an income or not, the chances for a significant return become smaller and smaller. But investing not just in land but also in property – which includes land, structures and everything – is a sound strategy that secures a long-term income. Although land is finite and static, improvements – and the potential for improvements – to structures on the property are dynamic.